What does a seven month blogging hiatus look like? Well, in Nested's case, we're pretty sure that it looks pretty adorable and something like this little one. Did you know that if you sign up and receive Nested by mail, you'll not only get our content delivered straight to your email inbox, but you'll also be entered to win a monthly prize? Well, if you didn't, you do now. It's a new month so congratulations are in order to Nicole K. for being our August Nested newsletter winner. She receives a $25 The Silly Wagon gift card. And now onto September! Thanks go to Simply Silhouettes for providing Nested with a $30 gift card to their store. 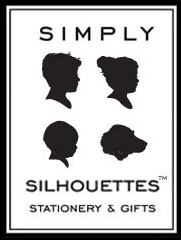 Simply Silhouettes "is a collection of custom designed silhouette products created by husband and wife team, Patrick and Angela Flynn. Destined to become heirlooms, family and pet silhouette portraits are created with classic styling, handcrafted warmth and not least, a touch of elegant whimsy." We love their "our story" page because it sums up why so many mothers and fathers have started their own online businesses. Definitely check out Simply Silhouettes! We're also amazed that it's already September. Blogging here at Nested has been a bit slower than usual due to the impending arrival (a matter of weeks) of a new product tester. July Drawing and on to August! It's a new month so congratulations are in order to missnikkisixx for being our July Nested newsletter winner. She receives a $25 Land of Nod gift card. And now onto August! Thanks go to The Silly Wagon for providing Nested with a $25 The Silly Wagon gift card to award to this month's (August) winner. The Silly Wagon online boutique features unique goods for babies and children with an emphasis on products made by women artists and designers, family-owned businesses and products that make owners Whitney and Vered say WOW! Thanks go out to GoodyBlog for naming us a new blog worth checking out! We're still relatively young (we launched last a little less than two weeks ago) so the link love is even more appreciated! We show you how to make a crayon pouch for your kids using a couple pieces of fabric and as little stress as possible. Where to find good stock art to decorate your nursery or kid's room. Even if you can't have sushi for nine months, you can still obsess about it. Breaking down the contents of one nursery. Given the task to throw a shower? Here are some printouts to make the games a bit classier. Thanks for stopping by and we hope you like what you see! To those visiting from Craftzine, welcome! We've just updated the original Fold-Up Crayon Pouch post to include a PDF version of the instructions that you can download and print out. And if you make the pouch, be sure to let us know at nestedblog (at) gmail.com! In case you've been trying to sign up to receive Nested posts delivered to your email daily and have been encountering an error, you'll be glad to know that we got to the bottom of the problem. It should be working now so go and sign up. And don't forget, if you sign up and receive Nested updates, you have a chance at winning a $25 Land of Nod gift card to be given away at the the end of July.